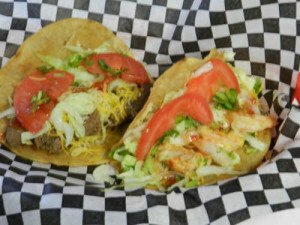 Common knowledge around Taco Pete is that Mr.Pete or Reo (which ever you prefer to call the owner) drives a blue truck. In the past, whenever people came to Taco Pete and saw the truck out front they knew Mr.Pete was around somewhere. These days when you look out on the parking lot you don’t see that big blue truck as often. Why is this you might ask? The simply answer is quality is key, because he is constantly out shopping to get all the singular ingredients that form the delectable menu we have. From the very beginning we have done everything we can to ensure freshness within every bite. From tacos to burritos to wings, we are constantly bringing in fresh produce and meats to prepare these end results by focusing on every piece combined that make them. We are constantly preparing by cutting produce, making our famous secret recipe taco sauce, and meats almost daily for you our customers. We go through pounds upon pounds of meat a day and even more so as our customer base grows. Even though all this preparation can be tiresome, we continue to stay true to this freshness not only because is it what we believe in, but because we know for a fact it is what you keep coming back for.